Obama is not the only africanamerican given away money or bailouts these days!! 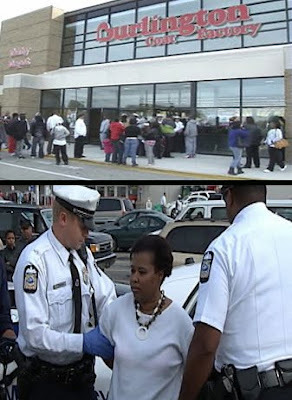 Columbus, OH (The Weekly Vice) – Linda Brown of Ohio was arrested Tuesday after she set off a riot in a Burlington Coat Factory store after announcing to shoppers she had won the lottery and would be paying for everyone's purchases. According to police, brown arrived at the store in a stretch Hummer limo, announced to patrons that she had just won $500,000 in the lottery, and offered to pay for everyone's purchases. Shoppers who were initially elated with the offer quickly turned into a riot when they discovered the woman's offer was nothing more than a hoax. Investigators say at least 500 excited shoppers crammed into the cashier isles, while 1,000 more were outside the store waiting to get in. Store managers say the woman spent approximately $5,000 before her credit car became maxed out. Brown announced that she’d be going to the bank to secure more cash, but when she returned empty handed, excitement turned to anger. Police say that's when customers began throwing merchandise, ransacking store shelves and stealing merchandise. "Everybody was like 'I still want my free stuff,' and that started the riot," said police Det. Steven Nace. "It looks like Katrina went through the store." Brown was booked into jail on three outstanding warrants for aggravated menacing, misuse of a 911 system and causing false alarms. Additional charges may be pending once a mental health evaluation has been performed. Capitol Hill Inquirer :: Political Humor :: Political Cartoons.